Once per game, when Li E is on the brink of death, she can discard all her cards and flip her character card. She then keeps doing judgments until the total of all the cards is larger than fourteen. She keeps all those cards and returns to full health. 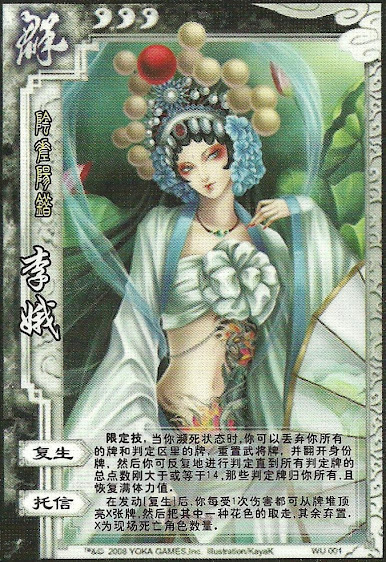 After Li E uses POWER ONE, whenever she is damaged, she can show X cards from the top of the deck. She takes all the cards of any suit she chooses, then discards the rest. X is the number of player that have died. Li E can only use "POWER ONE" once much like Pang Tong's "Nirvana". When she uses this, she does keep the card that puts her over 14. Li E can only use "POWER TWO" after she has had to use "POWER ONE".